1) Among the authors from our paper of the month July 2011 5 are part of the Sydney Young Surveyors group. Kate Fairlie is at the same time also Chair of the FIG Young surveyors network. “Spatially Smart Wine” was a project initiated by an enthusiastic group of Sydney Young Surveyors, with the support of the Institute of Surveyors New South Wales and the School of Surveying and Spatial Information Systems and the University of New South Wales. In this research geospatial technologies are evaluated for precision viticulture, supporting organic and biodynamic principles. The vineyard application is demonstrated of a teleoperated vehicle with three dimensional laser mapping and GNSS localisation to achieve centimetre-level feature position estimation. Sustainable agriculture to feed a growing population is one of the world’s critical challenges. In smaller scale farms, such as vineyards, a key research question is how to achieve consistent, optimised yields to minimise artificial system inputs and environmental damage. In this research, we evaluate geospatial technologies for precision viticulture, supporting organic and biodynamic principles. We demonstrate the vineyard application of a tele-operated vehicle with three dimensional laser mapping and GNSS localisation to achieve centimetre-level feature position estimation. Precision viticulture is not a new concept, having evolved from precision agriculture in the 1990s. Geospatial technologies have much to contribute to this field, with smaller scale vineyards requiring customisable applications and high precision positioning. Sustainable farming practices, including organic and biodynamic principles, further require the integration of multiple layers of spatial information to optimise yield and achieve long term sustainable outcomes. Key applications for geospatial data include tailored multi-layer farm maps (information systems), variable mulching, irrigation, spraying and harvesting. Technologies evaluated in this project include multi-layered information systems, GNSS receivers, Continuously Operating Reference Stations (CORS) and related hardware – with the integration of technologies and farmer usability key considerations. We also test the University of New South Wales Mechatronics Unmanned Ground Vehicle (UGV) in the vineyard. This vehicle generates georeferenced point clouds in real-time while being tele-operated through the vineyard. A major feature of this vehicle's sensors is the use of off-the-shelf hardware, allowing it to be retrofitted to existing vehicles of any scale. The accuracy of the generated point clouds is calculated and compared with that obtained from aerial LiDAR. Automation of existing actuators for controlling yield-dependent variables such as mulching and irrigation via feedback from the combined sources of data is clearly the future of precision viticulture. The end product? Spatially smart wine. Precision viticulture (PV) is styled from the zonal management paradigm of precision agriculture, where large homogeneous fields are divided into smaller units based on yield or other field characteristics which may be differentially managed (Lamb et al., 2002, Bramley, 2009, Bramley and Robert, 2003) (note that McBratney et al. (2005) suggest the definition of precision agriculture is continually evolving as we develop further technologies and greater awareness of agricultural processes). PV acknowledges the numerous spatial variations that affect grape quality and yield, including soil characteristics, pests and diseases and topography (Hall et al., 2003, Arnó et al., 2009), providing land managers with the tools to quantify and manage this variability (Proffitt, 2006). Land managers can thus ‘selectively’ treat areas, for example by the variable application of mulch, water, fertiliser, sprays etc. The general process of PV is cyclical across observation, evaluation and interpretation - which informs a targeted management plan followed by ongoing observation and evaluation (Bramley et al., 2005). The benefits of PV are increased knowledge of vineyard processes, allowing for targeted improvements to yield, wine quality, reduced disease incidence and increased resilience across the vineyard (Johnson et al., 2003). Data capture undertaken as part of PV can inform mechanised operations for greater efficiency in irrigation, spraying, mulching and pruning, and selective harvesting. Decision support systems are further supported and may aid land managers when in the field (Johnson et al., 2003). PV mitigates against the growing problems of climate change (Battaglini et al., 2009, Shanmuganthan et al., 2008), food security (Gebbers and Adamchuk, 2010) and supports the growing awareness of the consumer and market demands (Delmas and Grant, 2008, Rowbottom et al., 2008, Chaoui and Sørensen, 2008). Research into the use of autonomous machinery in vineyards is still young and presents opportunities for further development (Grift et al., 2008, Longo et al., 2010). The use of wireless sensor networks is a recent addition to PV, but not yet routinely implemented (see examples in Shi et al., 2008, Matese et al., 2009, López Riquelme et al., 2009, Morais et al., 2008). A significant limitation of current applications and research is the lack of an appropriate, multi-functional decision support system (McBratney et al., 2005, Arnó et al., 2009). This research focuses on the contribution of surveying and spatial technologies to PV, with a focus on sensor applications for tele-operated and autonomous machinery. This paper reports the preliminary findings of a scoping fieldtrip, with an outline of technologies tested for their utility and suitability to the client’s needs. ‘Spatially Smart Wine’ is a joint initiative of the International Federation of Surveyors (FIG) Young Surveyors Network, the New South Wales Institution of Surveyors Young Surveyors Group (Australia) and the University of New South Wales Schools of Surveying and Mechatronic Engineering. 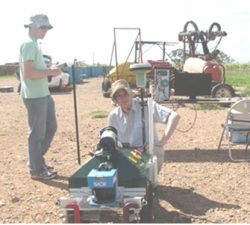 The project was initiated to improve the networks and skills of young surveyors in the Sydney region, and to generally improve community understanding of surveying (see Figure 1). Additional benefits are increasing surveyors’ knowledge of PV! Figure 1: The authors at Jarrett's Vineyard General details of how the project was run are reported in Fairlie and McAlister (2011). Fieldwork was undertaken at Jarrett’s wines, a small to medium (300 hectare) vineyard 30km south west of Orange, NSW, Australia – approximately 300km west of Sydney. Established just over 15 years ago, the management of the vineyard now incorporates organic and biodynamic farming principles. The vineyard manager sees PV as a critical element of sustainable vineyard management. Biodynamic viticulture rejects the use of synthetic chemical fertilisers and pesticides. Both organic and biodynamic farming practices embrace the use of natural products, but the underlying philosophy of biodynamics is the use of soil and plant ‘preparations’ to stimulate the soil and enhance plant health and product quality (Reeve et al., 2005). The adoption of organic and/or biodynamic farming practices is likely to increase with greater awareness of climate change and sustainability requirements (Turinek et al., 2009). The general thesis of these farming processes is sustainable agriculture, with no long term environmental damage. There remain a number of research gaps in organic and biodynamic farming practices – for example, critics cite a lack of scientific understanding and rigour within the biodynamic field (Kirchmann, 1994) . PV technology has a role to assist, for example in research on soil nutrient variability, mapping and management, weed control, and achieving dual outcomes of economic and environmental sustainability. Research is advancing with regards to robotic weeders, online systems to manage soil nutrients and crops, but commercial adoption and availability of products is limited (see Dedousis et al., 2010 for an overview of the field). The general goal of the fieldwork was the testing of survey and spatial technologies for PV, particularly taking into account client needs and fitness-for-purpose. In the following sections we will provide an overview of surveying technologies applicable to PV, an initial high level qualitative analysis of technologies tested, and finally an overview of the outputs and accuracies achieved in uniting the Unmanned Ground Vehicle with surveying technologies. PV requires much finer sampling than precision agriculture (Bramley and Janik, 2005), hence the greater need for surveying and spatial professionals to engage with this industry. Viticulture is particularly suited to spatial and surveying technologies, due to the ‘fixed’ nature of plantings and the perennial nature of crops (Arnó et al., 2009) and spatial analysis is critical to managing vineyard productivity and minimising risk in small scale vineyards. Vineyard establishment in Australia will typically involve soil sampling (including type mapping, salinity measurements and moisture distribution), topographic mapping and surveyor set-out of plantings, with grape varieties located according to appropriate soil type, nutrient and moisture levels. Topographic variation is a critical driver of vineyard yield variation (see Bramley 2006, Bramley and Williams 2007), particularly in the Australian case where yield is closely linked to water supply and generally varies with topography (Bramley 2003b). Once established there are a number of ongoing roles for spatial data and analysis. Vineyard leaf area is a key determinant of grape characteristics and wine quality and is a predictor of fruit ripening rate and instances of infestation and disease. Vineyard leaf area measurements can inform pruning procedures, shoot thinning, leaf removal and irrigation (Johnson et al., 2003). International monitoring of emissions for climate change mitigation and adaptation is further creating a role for spatial technology in the vineyard. Transient biomass (changes in biomass from year to year) provides an indication of the most productive areas of the vineyard, and monitoring of biomass may be a future requirement of climate change policy. Measurement of transient biomass year by year (i.e. 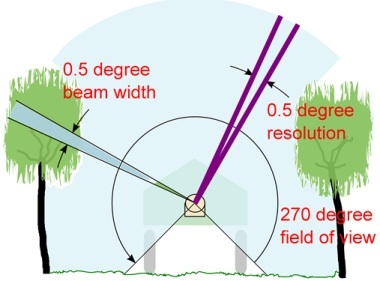 following pruning) is common, but difficult and expensive – remote imaging options present much more efficient forms of measurement (Keightley and Bawden, 2010). Uniquely, Mazzetto (2010) present a ground-based mobile remote sensing lab to allow more frequent and targeted vineyard spatial analysis. Table 1 provides an overview of sensor technologies for PV and their applications and benefits. Table 1 : Surveying technologies and their applications to PV. Compiled from (Keightley and Bawden, 2010, Bramley, 2009, Bramley and Robert, 2003, Lamb et al., 2002, Grote et al., 2003, Bramley et al., 2005) Note the focus of this table is on technologies traditionally associated with the geospatial and surveying professions. It does not represent an exhaustive list of sensor technologies used in precision viticulture. Jarrett’s wines, the subject location of this study, had undertaken much of the above however it soon became apparent that data was poorly managed, with a mix of hard- and soft-copy data. The importance of spatial data management is rarely reported in the PV literature, and the ad hoc nature of spatial data acquisition and surveyor involvement limits the opportunities for an efficient spatial data management system to be implemented. Ongoing: Develop knowledge of the vineyard, including vine mapping, identification of yield and foliage density etc. to inform pruning and harvesting. In order to achieve Differential GPS and RTK solutions, correction data from CORSnet-NSW, the New South Wales government funded Continuously Operating Reference Station (CORS) network, was utilised. The closest CORS was Orange (approximately 30km from site), although virtual base DGPS solutions, Virtual Reference Station (VRS) and Master Auxiliary Concept (MAC) solutions provided through the network were also tested. The vineyard manager was present at testing, and provided valuable insight into the suitability and application of these technologies to the vineyard. We will examine each technology and its application in the vineyard in the following subsections. Large amounts of data are associated with PV. Given the surveyor cannot remain on hand, vineyard managers need to be able to easily create, store and retrieve spatial data. Handheld computers are cost-effective and convenient for basic mapping and data collection tasks commonly performed for precision agriculture practices (Koostra et al, 2003). The Getac Toughbook is both GIS- and GPS-enabled. Note that not all Toughbooks are GPS-enabled, but GPS add-ons are easily attainable. In this case study, the vineyard manager had recently purchased a Toughbook, deeming it necessary for day-to-day tasks within the vineyard including the onsite viewing of spatial data, tracking of tasks and identification of follow-up areas. For example, vineyard inspections to identify follow-up locations for pest and weed treatment, or localised incidents of vine disease. For efficient and integrated use (i.e. across multiple computers and personnel) some form of mapping software is a requirement. ESRI’s ArcPad was used in this field test, but it is by no means the only, or necessarily the best option. Advanced spatial users can easily develop mapping applications, mashups and queries to best inform vineyard decision making, using either ESRI, open source or other applications. This is identified as a significant market area for further development as no immediate, easy-to-use and off-the-shelf options are known to the authors. Wireless connectivity between hardware is a further option under consideration on the farm. Problems observed in the field using the Toughbook include difficulties of use in bright sunlight, screen size and intuitiveness to users not accustomed to spatial data. There was a need for better accessories to ease its utility in the field (e.g. vehicle and personal holders and data entry tools). GPS and CORS were deemed critical enablers for in the field applications. The Leica Zeno is marketed as the ‘most rugged and versatile GNSS/GIS handheld in the market’(Leica Geosystems, 2009). The Zeno provides a differential correction to the GPS coordinates which would allow operators to easily determine the specific row and vine for follow up inspections. The Leica Zeno used in the pilot project also had ESRI ArcPad installed on it. We found the Zeno to be more suited to users with a spatial background as it has functionalities (e.g. DGPS capabilities) that can be easily understood by a spatial-user and vice versa. The Toughbook on the other hand has limited high-accuracy surveying capabilities, thus making it easier to use and therefore suitable for non-spatial users. RTK solutions were found to primarily support the implementation of machine guidance operations. For the efficient operation of auto-steered machinery, as discussed in the following section, key aspects (especially obstacles) of the vineyard would need to be mapped to a high level of accuracy. Auto-steer technologies would then use RTK position solutions, with operator alerts if the machinery began to run off-centre due to degradation of the RTK signal or other problem such as close proximity to buildings and trees due to multipath. With all three technologies having useful application within the vineyard it is evident that an integrated data management system would be highly beneficial. A decision support system can be used and integrated with the process model to represent the use of information (Smith et al., 1998). With wireless connectivity available on all three devices this management system need not be provided by the vineyard but is possible through broader precision agriculture support services. It is in this area that significant research and development can still take place to value-add on the implementation of positioning and guidance technologies in the vineyard. The Australian government announcement of a National Broadband Network is also expected to further this research area. Building applets that customise a collection of tools and scripts. A chief concern with the use of ESRI’s ArcPad is the licence cost and user training needs. The above features would need to be set up by a more experienced spatial professional. A number of alternative GIS and spatial data display/management systems exist, but testing these is beyond the scope of this paper (http://opensourcegis.org details many alternative options. Google Earth is a familiar option that many lay users would find easy to adopt). LiDAR (Light Detection And Ranging) is an optical remote sensing technology which is used to measure properties of scattered light to find range, elevation and other information of a distant target. It records not only the multi-reflection laser pulses that return from the object but the intensity information for each returned laser pulse. The LiDAR system is widely used in geoinformatics, archaeology, geography, geology, geomorphology, seismology, remote sensing and atmospheric physics (Cracknell et al, 2007). Aerial LiDAR data was gathered during a flight over the vineyard (LiDAR was flown over the area by the NSW Land and Property Management Authority for calibration purposes of their newly acquired aircraft) and Figure 3 shows the resulting aerial point cloud. Figure 2 shows a subset of the points overlaid on aerial imagery. 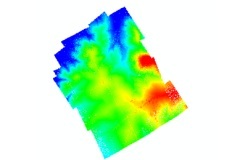 The LiDAR imagery was obtained for a terrain map of the area of study. It was envisaged that LiDAR technology may improve understanding of vineyard processes and foliage density, which would help develop precision pruning and harvesting of future crops. The vineyard manager already had a time series of multispectral aerial imagery data (as a general indication, Bramley (2009) reports the cost of multispectral imagery at AUD$30/ha), and LiDAR imagery was deemed to further augment this. It is estimated that the cost of aerial-LiDAR to be around AU$3000 for the survey of the vineyard. The LiDAR was flown, analysed and processed by the Land, Property and Management Authority (LPMA) in Bathurst (see Table 2 for specifications). Data was predominantly processed using TerraMatch and TerraScan MicroStation plug-ins. In addition to that, the plug-in LP360 by QCoherent was also used to check data quality and to verify the processed (final) LAS files. TerraMatch was used to apply corrections and changes to the LAS files based on (1) heading, (2) roll, (3) pitch, (4) mirror scale and (5) z-shift (elevation) of the points captured based on the movement of the plane relative to the point-capture exercise. The LiDAR datasets were classified according to the “spatial accuracy” of the data. Once a LiDAR survey is determined to be “spatially accurate”, any remaining significant errors in the data are likely to be the result of incorrect classification. For example in wetland areas, due to the lack of actual ground strikes, dense vegetation is often classified as ground by the automated algorithms. A significant amount of manual effort is then required to correct the classification attributes (LPMA, 2010). Table 3 briefly outlines the five classification levels as defined by the LPMA. The levels are allocated by the various automated and manual processes. Successive level reflects increasing classification completeness and effort. For the purpose of this project, the aerial LiDAR data has been processed to Level 2 standards, where the anomalies found in the ground data were removed to create a ground surface suitable for ortho-rectification of imagery with minimum effort (LPMA, 2010). The following discussion on LiDAR accuracy is based on the LPMA standards for processing aerial-LiDAR data (This section is an excerpt from the LPMA Standard LiDAR Product Specifications, Version 2.0, July 2010). Vertical accuracy is assessed by comparing LiDAR point returns against survey check points on bare open ground. It is calculated at the 95% confidence level as a function of vertical RMSW (as per ICSM Guidelines for Digital Elevation Data 2008 - retrieved online from the ‘Intergovernmental Committee on Surveying & Mapping’ (ICSM) website - http://www.icsm.gov.au/icsm/elevation/ICSM-GuidelinesDigitalElevationDataV1.pdf). This is undertaken after the standard relative and absolute adjustment of the point cloud data has taken place (i.e. flight line matching and shift/transformation to local AHD). Horizontal accuracy is checked by comparing the LiDAR intensity data viewed as a “TIN” surface against surveyed ground features such as existing photo point targets. To date our analysis of ground comparisons shows that although the vertical accuracy achieved on bare open ground is well within the requirements for Category 1 Digital Elevation Model (DEM) products as specified in the ICSM Guidelines for Digital Elevation Data, local geoid and height control anomalies may degrade the accuracy on large coastal projects. 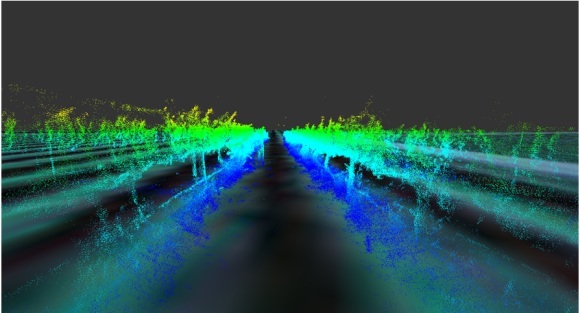 Advantages of LiDAR include the high data accuracy, large area coverage and quick data turnaround. The cost is small compared with the acquisition of similar accuracy level data using a team of surveyors and total stations (Note the authors did not pay for the LiDAR data collection in this analysis. An estimated cost was provided by the LPMA, a government department, of around AU$3000 for the 300ha vineyard. As a general comparison, Bramley (2009) reports the cost of multispectral imagery at AUD$30/ha, however prices are decreasing at a rapid rate). Disadvantages include the weather-dependence of LiDAR, and the inability of LiDAR to penetrate dense canopies (such as vines during harvest season), thus preventing the creation of accurate DEMs. Canopy imaging does, however, present a further opportunity for LiDAR applications (see Table 1), however more research is required and it may be possible to derive the same benefits from terrestrial applications (see Section 4.5, Table 5 for a comparison of aerial and terrestrial LiDAR solutions). Here we present an Unmanned Ground Vehicle (UGV) which contains technologies for automated yield estimation which are readily applicable to many existing agricultural machines. The UGV was developed in the School of Mechanical and Manufacturing Engineering at the University of New South Wales under the direction of Associate Professor Jayantha Katupitiya and Dr Jose Guivant. As shown in Figure 4, it is a four wheeled vehicle equipped with sensors and actuators for tele-operation and full autonomous control. Weighing 50kg, it is a comprised of Commercial-Off-the-Shelf (COTS) sensors, a custom-made mechanical base and a low-cost onboard laptop with a wireless connection to a remote Base Station (BS). Of particular note is ready retrofitting capacity of the COTS sensors to existing farm machinery. The equipment contained in the vehicle is shown in Table 4. Of this the relevant items are the rear 2D LiDAR sensor, the IMU, the CORS-corrected GPS receiver and the wheel encoders. Together with the onboard computer, these items allow accurate georeferenced point clouds to be generated which are accurate to 8cm. The output is not limited to point clouds, as any other appropriately sized sensors can be integrated to provide precise positioning of the sensed data, either in real-time or by post-processing. The following paragraphs show how the pose of the robot is accurately estimated and then how this pose is fused with the laser data to obtain 3D point clouds. Given the uncertainty of the robot pose, we also derive expressions for the resultant uncertainty of each point in the point cloud. Furthermore, the average case accuracy is compared with that obtained from aerial LiDAR and the advantages and disadvantages of both methods of data gathering are discussed from the perspective of PV. As presented in Section 3.2, the CORS-linked GPS sensor mounted on the UGV provides both the position and position uncertainty of the vehicle in ECEF coordinates. In this case the MGA55 frame was used to combine all the sensor data for display in one visualisation package. The GPS position was provided at 1Hz and given the high frequency dynamics of the robot’s motion, higher frequency position estimation was necessary. Hence an inertial measurement unit (IMU), containing accelerometers and gyroscopes, was mounted on the vehicle providing measurements at 200Hz. The output of this IMU was fused with the wheel velocities as described in (Whitty et al., 2010) to estimate the short term pose of the vehicle between GPS measurements. The IMU also provided pitch and roll angles, which were used in combination with the known physical offset of the GPS receiver to transform the GPS provided position to the coordinate system of the robot. Given the time of each GPS measurement (synchronised with the IMU readings), the set of IMU derived poses between each pair of consecutive GPS measurements was extracted. Assuming the heading of the robot had been calculated from the IMU readings, the IMU derived poses were projected both forwards and backwards relatively from each GPS point. The position of the robot was then linearly interpolated between each pair of these poses, giving an accurate and smooth set of pose estimates at a rate of 200Hz. Since the GPS measurements were specified in MGA55 coordinates and the pose estimates calculated from these, the pose estimates were therefore also found in MGA55 coordinates. The primary sensor used for mapping unknown environments was the SICK LMS151 2D laser rangefinder. Figure 6 pictures one of these lasers, which provided range readings up to a maximum of 50m with a 1σ statistical error of 1.2cm. Figure 5 shows the Field of View (FoV) as 270° with the 541 readings in each scan spaced at 0.5° intervals and recorded at a rate of 50Hz, giving about 27 000 points per second. Its position on the rear of the robot was selected to give the best coverage of the vines on both sides as the robot moves along a row. To accurately calculate the position of each scanned point, we needed to accurately determine the position and orientation of the laser at the time the range measurement was taken. All of the IMU data and laser measurements were accurately time stamped using Windows High Performance Counter so the exact pose could be interpolated for the known scan time. Given the known offset of the laser on the vehicle, simple geometrical transformations were then applied to project the points from range measurements into space in MGA55 coordinates. Complete details are available in Whitty et al., (2010) which was based on similar work in Katz et al. (2005) and Guivant (2008). This calculation was done in real-time, enabling the projected points – collectively termed a point cloud – to be displayed to the operator as the UGV moved. 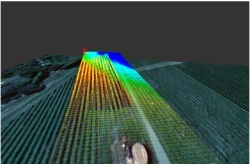 The display of the point cloud was done using a custom built visualisation program which was also adapted to read in a LiDAR point cloud and georeferenced aerial imagery obtained from a flight over the vineyard. Since all these data sources were provided in MGA55 coordinates, it was a simple matter to overlay them to gain an estimate of the accuracy of the laser measurements. Figure 7 shows the terrestrial point cloud overlaid on the image data where the correspondence is clearly visible. Given that the point cloud is obtained in 3D, this provides the operator with a full picture of the vineyard which can be viewed from any angle. Although the above point cloud generation process has been described in a deterministic manner, in practice measurement of many of the robot parameters is usually not precise. By performing experiments, we were able to characterise these uncertainties individually and then combine them to estimate the uncertainty in position of every point we measured. In the field of robotics, these uncertainties are typically characterised as a covariance matrix based on the standard deviations of each quantity, assuming that they are normally distributed. The covariance matrix giving the uncertainty of the UGV’s pose in MGA55 coordinates is a 6x6 matrix. The UGV’s pose itself is given by a vector which concatenates the 3D position and the orientation given in Euler angles. Since the GPS receiver was offset from the origin of the UGV’s coordinate system, the GPS provided position was transformed to the UGV’s coordinate system by rigid body transformation. However, the uncertainty of the angular elements of the pose meant that the GPS uncertainty must not only be shifted but be rotated and skewed to reflect this additional uncertainty. An analogy is that of drawing a straight line of fixed length with a ruler. If you don’t know exactly where to start, then you have at least the same uncertainty in the endpoint of the line. But if you also aren’t sure about the angle of the line, the uncertainty of the endpoint is increased. A similar transformation of the UGV uncertainty to the position of the laser scanner on the rear of the UGV provided the uncertainty of the laser scanner’s position. Then for every laser beam projected from the laser scanner itself, a further transformation gave the covariance of the projected point due to the angular uncertainty of the UGV’s pose. Additionally, we needed to take into account uncertainty in the measurement angle and range of individual laser beams. This followed a similar pattern and the uncertainty of the beam was calculated based on a standard deviation of 0.5 degrees in both directions due to spreading of the beam. Once the uncertainty in the beam, which was calculated relative to the individual beam, was found, it was rotated first to the laser coordinate frame and then to the world coordinate frame using the corresponding rotation matrices. Finally, the uncertainty of the laser position was added to give the uncertainty of the scanned point. An experiment was conducted at the location detailed in Section 1.2. The UGV was driven between the rows of vines to measure them in 3D at a speed of about 1m/s. The average uncertainty of all the points was calculated and found to be 8cm in 3D. Table 5 shows how this compares with about 1.2m for the aerial LiDAR but has the disadvantage of a much slower area coverage rate. The major advantages however are the increased density of points (~3000 / m3), ability to scan the underside of the vines and greatly improved resolution. Also, the terrestrial LiDAR can be retrofitted to many existing agricultural vehicles and used on a very wide range of crops. Limited vertical accuracy – a drawback of GPS – is a major restriction but this can be improved by calibrating the system at a set point with known altitude. For PV, the terrestrial LiDAR system clearly offers a comprehensive package for precisely locating items of interest. Further developments in processing the point clouds will lead to estimation of yield throughout a block and thereby facilitating implementation of performance adjusting measures to standardise the yield and achieve higher returns. For example, a mulch delivery machine could have its outflow rate adjusted according to its GPS position, allowing the driver to concentrate on driving instead of controlling the mulch delivery rate. This not only reduces the amount of excess mulch used but reduces the operator’s workload, with less likelihood of error such as collision with the vines due to fatigue. In this paper we have evaluated several state-of-the-art geospatial technologies for precision viticulture including multi-layered information systems, GNSS receivers, Continuously Operating Reference Stations (CORS) and related hardware. These technologies were demonstrated to support sustainable farming practices including organic and biodynamic principles but require further work before their use can be widely adopted. Limitations of the current systems were identified in ease-of-use and more particularly in the lack of a unified data management system which combines field and office use. While individual technologies such as GIS, GNSS and handheld computers exist, their integration with existing geospatial information requires the expertise of geospatial professionals, and closer collaboration with end users. In addition we demonstrated the application of an unmanned ground vehicle which produced centimetre-level feature position estimation through a combination of terrestrial LiDAR mapping and GNSS localisation. We compared the accuracy of this mapping approach with aerial LiDAR imagery of the vineyard and showed that apart from coverage rate the terrestrial approach was more suited in precision viticulture applications. Future work will focus in integrating this approach with precision viticulture machinery for estimating yield and controlling yield-dependent variables such as variable mulching, irrigation, spraying and harvesting. The end product? Spatially smart wine. The authors wish to acknowledge the following bodies and individuals who provided equipment and support: Land and Property Management Authority (in particular Glenn Jones), CR Kennedy (in particular Nicole Fourez), ESRI Australia and the University of New South Wales. Particular thanks go to the vineyard owner and manager, Justin Jarrett and family. ARNÓ, J., MARTÍNEZ-CASASNOVAS, J., RIBES-DASI, M. & ROSELL, J. (2009) Review. Precision Viticulture. Research topics, challenges and opportunities in site-specific vineyard management. Spanish Journal of Agricultural Research, 7, 779-790. BATTAGLINI, A., BARBEAU, G., BINDI, M. & BADECK, F. W. (2009) European winegrowers’ perceptions of climate change impact and options for adaptation. Regional Environmental Change, 9, 61-73. BRAMLEY, R. (2009) Lessons from nearly 20 years of Precision Agriculture research, development, and adoption as a guide to its appropriate application. Crop and Pasture Science, 60, 197-217. BRAMLEY, R., PROFFITT, A., HINZE, C., PEARSE, B., HAMILTON, R. & STAFFORD, J. (2005) Generating benefits from precision viticulture through selective harvesting. Wageningen Academic Publishers. BRAMLEY, R. & ROBERT, P. (2003) Precision viticulture-tools to optimise winegrape production in a difficult landscape. American Society of Agronomy. CHAOUI, H. I. & SØRENSEN, C. G. (2008) Review of Technological Advances and Technological Needs in Ecological Agriculture (Organic Farming). DEDOUSIS, A. P., BARTZANAS, T., FOUNTAS, S., GEMTOS, T. A. & BLACKMORE, S. (2010 ) Robotics and Sustainability in Soil Engineering. Soil Engineering. Springer Berlin Heidelberg. DELMAS, M. A. & GRANT, L. E. (2008) Eco-labeling strategies: the eco-premium puzzle in the wine industry. FAIRLIE, K. & MCALISTER, C. (2011) Spatially Smart Wine - Getting Young Surveyors to Network in the Vineyard! And other Australian young surveyor activities. . International Federation of Surveyors Working Week 2011. Marrakech, Morocco. GEBBERS, R. & ADAMCHUK, V. I. (2010) Precision Agriculture and Food Security. Science, 327, 828-831. GIL, E. (2007) Variable rate application of plant protection products in vineyard using ultrasonic sensors. Crop Protection, 26, 1287-1297. GRIFT, T., ZHANG, Q., KONDO, N. & TING, K. (2008) A review of automation and robotics for the bioindustry. Journal of Biomechatronics Engineering, 1, 37-54. GROTE, K., HUBBARD, S. & RUBIN, Y. (2003) Field-scale estimation of volumetric water content using ground-penetrating radar ground wave techniques. Water Resour. Res, 39, 1321. GUIVANT, J. E. (2008) Real Time Synthesis of 3D Images Based on Low Cost Laser Scanner on a Moving Vehicle. V Jornadas Argentinas de Robotica, Bahia Blanca. HALL, A., LOUIS, J. & LAMB, D. (2003) Characterising and mapping vineyard canopy using high-spatial-resolution aerial multispectral images. Computers & Geosciences, 29, 813-822. JOHNSON, L., ROCZEN, D., YOUKHANA, S., NEMANI, R. & BOSCH, D. (2003) Mapping vineyard leaf area with multispectral satellite imagery. Computers and Electronics in Agriculture, 38, 33-44. KATZ, R., MELKUMYAN, N., GUIVANT, J., BAILEY, T. & NEBOT, E. (2005) 3D sensing framework for outdoor navigation. Australian Conference on Robotics and Automation (ACRA), Proceedings of. Citeseer. KEIGHTLEY, K. E. & BAWDEN, G. W. (2010) 3D volumetric modeling of grapevine biomass using Tripod LiDAR. Computers and Electronics in Agriculture, 74, 305-312. KIRCHMANN, H. (1994) Biological dynamic farming—An occult form of alternative agriculture? Journal of Agricultural and Environmental Ethics, 7, 173-187. LAMB, D., BRAMLEY, R. & HALL, A. (2002) Precision viticulture-an Australian perspective. ISHS. LEICA GEOSYSTEMS (2009) Leica Zeno 10 & Zeno 15. 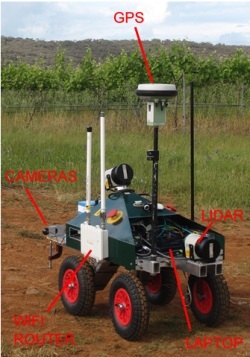 LONGO, D., PENNISI, A., BONSIGNORE, R., MUSCATO, G. & SCHILLACI, G. (2010) A Multifunctional Tracked Vehicle Able to Operate in Vineyards Using GPS and Laser Range-finder Technology. International Conference Ragusa SHWA2010 - September 16-18 2010 Ragusa Ibla Campus - Italy "Work safety and risk prevention in agro-food and forest systems". LÓPEZ RIQUELME, J., SOTO, F., SUARDÍAZ, J., SÁNCHEZ, P., IBORRA, A. & VERA, J. (2009) Wireless sensor networks for precision horticulture in Southern Spain. Computers and Electronics in Agriculture, 68, 25-35. MATESE, A., DI GENNARO, S., ZALDEI, A., GENESIO, L. & VACCARI, F. (2009) A wireless sensor network for precision viticulture: The NAV system. Computers and Electronics in Agriculture, 69, 51-58. MAZZETTO, F., CALCANTE, A., MENA, A. & VERCESI, A. 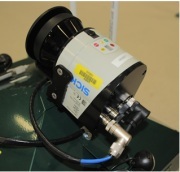 (2010) Integration of optical and analogue sensors for monitoring canopy health and vigour in precision viticulture. Precision Agriculture, 1-14. MCBRATNEY, A., WHELAN, B., ANCEV, T. & BOUMA, J. (2005) Future directions of precision agriculture. Precision Agriculture, 6, 7-23. MORAIS, R., FERNANDES, M. A., MATOS, S. G., SER DIO, C., FERREIRA, P. & REIS, M. (2008) A ZigBee multi-powered wireless acquisition device for remote sensing applications in precision viticulture. Computers and Electronics in Agriculture, 62, 94-106. PROFFITT, T. (2006) Precision viticulture: a new era in vineyard management and wine production, Winetitles. REEVE, J. R., CARPENTER-BOGGS, L., REGANOLD, J. P., YORK, A. L., MCGOURTY, G. & MCCLOSKEY, L. P. (2005) Soil and winegrape quality in biodynamically and organically managed vineyards. American journal of enology and viticulture, 56, 367. ROSELL, J. R., LLORENS, J., SANZ, R., ARNÓ, J., RIBES-DASI, M. & MASIP, J. (2009) Obtaining the three-dimensional structure of tree orchards from remote 2D terrestrial LIDAR scanning. Agricultural and Forest Meteorology, 149, 1505-1515. ROSELL POLO, J. R., SANZ, R., LLORENS, J., ARNÓ, J., ESCOL , A., RIBES-DASI, M., MASIP, J., CAMP, F., GR CIA, F. & SOLANELLES, F. (2009) A tractor-mounted scanning LIDAR for the non-destructive measurement of vegetative volume and surface area of tree-row plantations: A comparison with conventional destructive measurements. Biosystems Engineering, 102, 128-134. ROWBOTTOM, B., HILL, M., VALLEY, Y., HEATHCOTE, B. & STRATHBOGIE, B. (2008) Managing the nutrition of grapevines. Australian viticulture, 12, 85. SHANMUGANTHAN, S., GHOBAKHLOU, A. & SALLIS, P. (2008) Sensor data acquisition for climate change modelling. WSEAS Transactions on Circuits and Systems, 7, 942-952. SHI, L., MIAO, Q. & JINGLIN, D. (2008) Architecture of Wireless Sensor Networks for Environmental Monitoring. Education Technology and Training, 2008. and 2008 International Workshop on Geoscience and Remote Sensing. ETT and GRS 2008. International Workshop on. SIEGFRIED, W., VIRET, O., HUBER, B. & WOHLHAUSER, R. (2007) Dosage of plant protection products adapted to leaf area index in viticulture. Crop Protection, 26, 73-82. TURINEK, M., GROBELNIK-MLAKAR, S., BAVEC, M. & BAVEC, F. (2009) Biodynamic agriculture research progress and priorities. Renewable Agriculture and Food Systems, 24, 146-154. WHITTY, M., COSSELL, S., DANG, K. S., GUIVANT, J. & KATUPITIYA, J. (2010) Autonomous Navigation using a Real-Time 3D Point Cloud. 2010 Australasian Conference on Robotics and Automation. 1-3 December 2010 Brisbane, Australia. Spatially Smart Wine was a project initiated by an enthusiastic group of Sydney Young Surveyors, with the support of the Institute of Surveyors New South Wales and the School of Surveying and Spatial Information Systems and the University of New South Wales. The intent of the group is to provide informal networking and professional development opportunities for surveyors in the Sydney region. The Mechatronics group in the School of Mechanical and Manufacturing Engineering at the University of New South Wales, Australia conducts research in the preeminent Faculty of Engineering in Australia. Research is conducted into mobile robotics solutions primarily for agricultural automation but also for the defence and mining industries. The research includes advanced control systems, image processing, terrain mapping, aerial vehicle dynamics, advanced sensor data fusion, path planning, motion planning and navigation. The group is equipped with a wide range of unmanned systems, ranging from very small ground vehicles and aerial vehicles to commercially available large scale machines that have been retrofitted for autonomous operation. In addition the group also undertakes complex, large scale system development.